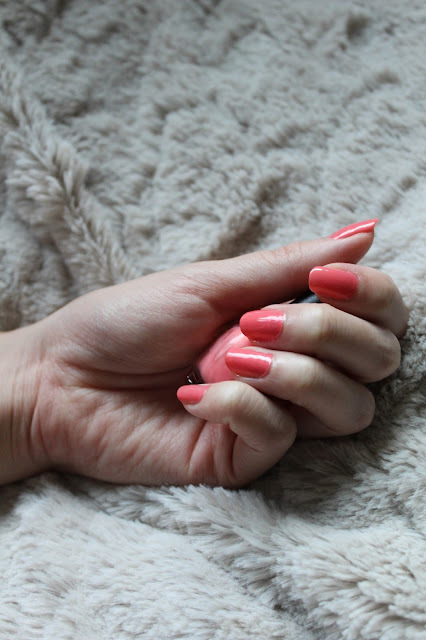 Described online as a "opaque vintage coral" this little OPI mini really lives up to his name. What this description is missing is that "How cute is that?" has a subtle gold shimmer to it. The gold shimmer adds a depth to the coral that really entices you into painting your nails with it. I feel that it's definitely a more orange coral, even maybe leaning towards that "smoked salmon" hue. Fortunately, and unfortunately, I only have a little mini of this. The color is absolutely beautiful and something I envision Barbie wearing if she ever got bored of her "hot Mattel pink." However, I must say, I've always had terrible luck with corals...whether it's with blushes, nail polishes, or lipsticks...they always seem to pull out the naturally yellow tones in my skin and teeth. Although this color looked so promising in the bottle, and beautiful, when put on my skin it just makes me look super yellow. You can buy "How cute is that?" here! A full sized bottle retails for $4.50! Sephora's having a sale right now! And for all those looking to identify their mini by serial code the serial code at the bottom of my bottle is: SE125 11265. To combat the aging problem I think I'll just wear it on my toes! I hope the swatches were helpful! Edit: A week later, there's a little tip wear, but on the whole it wears well!